SATURDAY, Jan. 7, 2017 (HealthDay News) -- Snow looks beautiful while it's falling, but each year thousands of Americans are hurt while shoveling or clearing the white stuff. Folks who are usually sedentary are at particular risk for injuries associated with bending and lifting shovels of heavy snow, the American Academy of Orthopaedic Surgeons says. Clearing snow can also put a lot of extra strain on the heart, the group warns. In 2015, more than 158,000 people were treated for injuries sustained while shoveling snow or removing ice. And snow blowers were involved in more than 15,000 injuries, the U.S. Consumer Product Safety Commission reports. 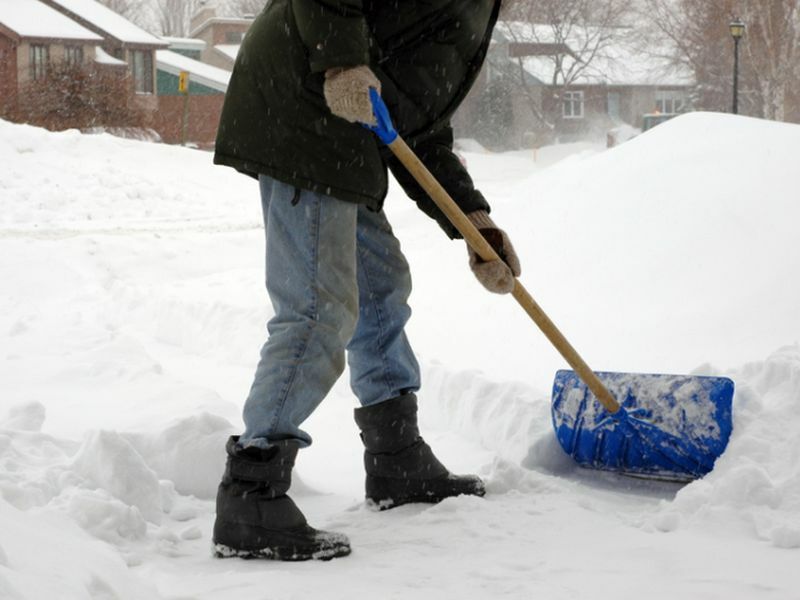 Back sprains and strains are among the most common snow removal injuries. However, cuts and even finger amputations are also reported each year. Talk to your doctor. Clearing snow is physically demanding and could put a lot of strain on the heart. If you're sedentary or have any medical problems, talk to your doctor before shoveling or operating a snow blower. Get the proper equipment. Make sure your snow shovel is light enough to lift without difficulty. It should also be a comfortable size for your height. Dress appropriately. Wear layers of light, water-repellent clothing to stay warm and dry. A hat, thick socks and warm gloves or mittens will keep your hands dry and free of blisters. Shoes or boots should have traction or soles that are slip-resistant. Don't wait. Start clearing snow as soon as there's a light covering on the ground. Starting early can help prevent injuries from trying to remove a lot of packed, heavy snow. Warm up and pace yourself. Snow removal is a workout. Like other physical activities, it's a good idea to do a 10-minute warm-up before you begin. Take breaks often and drink plenty of fluids to prevent dehydration. If you have chest pain or feel short of breath, stop clearing snow and get immediate medical attention. Watch out for ice. Be careful about patches of ice and uneven surfaces. Don't allow hats or scarves to cover your eyes. Lift carefully. Try to push snow. If you have to lift it, use your legs. Squat with your legs apart, knees bent and back straight. Never bend at the waist or hold a shovel full of snow with outstretched arms as this puts too much pressure on the spine. Shovel small amounts of snow and walk it to where you plan to dump it. Use your snow blower properly. Read the instructions. If snow jams the machine, stop the engine, wait more than five seconds and use a solid object to clear wet snow or debris from the chute. Never leave a running snow blower unattended. Be mindful of motor and blade recoil, which occurs after a snow blower is turned off. Also, keep kids younger than 15 at a safe distance from a snow blower. Never allow children to use these machines. Fuel up safely. Put fuel in a snow blower before you turn it on. Never add fuel when the engine is running or hot. Be mindful of power cords. Always know where the power cord is when using an electric snow blower. If it gets caught in the machine or comes in contact with the engine and burns, you could get shocked or electrocuted.